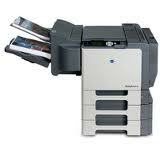 The Konica Minolta C30Px is a heavy duty colour printer with a speed of 31 ppm (in colour) and 37 ppm (black and white). It provides impressive features like standard duplexing, banner printing (8-1/2" x 47-1/4"), and advance job handling capabilities, all bundled in a compact machine suitable for offices. Replacement inks are on the pricey side, though. The compact Bizhub C30PX is a powerful desktop laser printer with a built in Emperon Print System that renders it compatible with Linux, Macintosh, and PC systems. It uses Simitri HD Colour and Photo Art Contone and has a resolution of 9600 x 600 dpi. This heavy duty Konica Minolta printer has a duty cycle of 120,000 prints. We like that that it can print directly from USB Flash Drives and cameras (up to 8-1/2" x 11"). No need to change TIFF, JPEG, or PDF files, as the Bizhub C30PX directly prints without opening any applications. For offices where document security is important, it offers 4-digit PIN verification technology. It saves energy with its printer memory technology, which allows easy reprinting. Users can create proof copies of documents for review before they print a job. The biggest drawback of the Konica Minolta Bizhub C30PX is how pricey its replacement inks and cartridges are. Though it is a fantastic coloured and black and white printer, it cannot scan and copy, unlike competing models.